It’s Thursday already and so the time is running out rapidly ahead of our second match in this year’s National Football League Division One campaign. Kerry are coming to town and Castlebar is sure to be rocking when they do. Throw-in at MacHale Park is 7pm on Saturday evening and Tipperary’s Derek O’Mahoney is the ref for the game. The last time we played Kerry at home – two years ago – they had the upper hand, winning by five points on a day when the alarm bells (incorrectly as it turned out) fairly started to jangle about the preservation of our top tier status. That was a rare enough spring loss to the Kingdom, however, as we’d won our four previous clashes and hadn’t tasted League defeat to them prior to then since as far back as 2011. Last year’s meetings with them were, of course, a total blast from our perspective. Two wins and a draw from three encounters, the second win an utterly emphatic and hugely satisfying All-Ireland semi-final replay victory over them. But I’m getting ahead of myself. Before giving another mention to that one, let’s rewind the tape back to the start of 2017 to review what kind of inter-county season Kerry had last year. Traditionally slow starters in the League, Eamon Fitzmaurice’s charges were out of the traps smartly twelve months ago. Letterkenny at this time of year isn’t a place for rich picking by visiting teams but Kerry went up there in early February last year and came away with a 2-17 to 1-17 win. We lost to Monaghan in our opening round tie the same weekend so it was with a fair bit of trepidation that we hit the road for Tralee to face the Kingdom the following weekend. But under the lights at Austin Stack Park, the lads looking boss in their new red and black jerseys and survived a serious wobble early on to carve out a really gutsy two-point win on a scoreline of 0-15 to 1-10. Following that loss, Kerry then slumped to another unexpected defeat two weeks later. 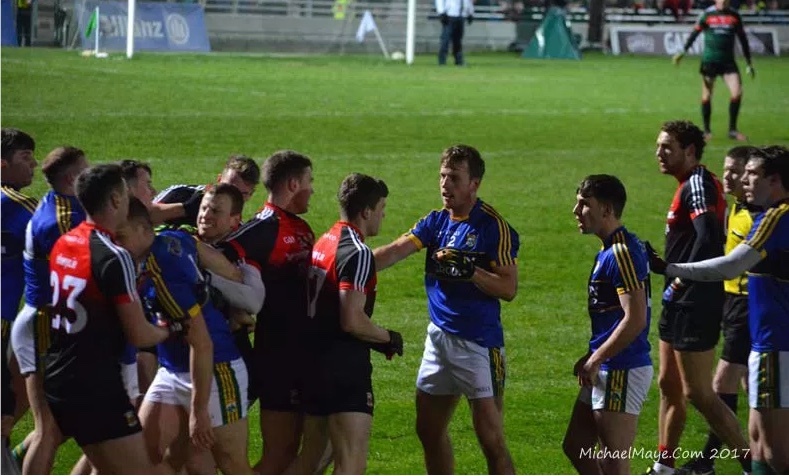 This one – a 2-8 to 1-10 reversal against Monaghan in Killarney – left them in a potentially dodgy position in the division after three rounds of matches but a week later they steadied the ship by going up to Hyde Park and beating Roscommon by 1-19 to 1-13. A fortnight after that Dublin rolled into town seeking a result that would see them equal Kerry’s decades-long record of remaining unbeaten for 34 matches. It turned out to be a right tempestuous encounter under the lights at Austin Stack Park, with loads of off-the-ball incidents and plenty of cards but Dublin eventually snatched a draw (it finished 0-13 apiece) thanks to an injury-time free from Paul Mannion. Another draw followed in Round 6, Kerry 0-13 to Cavan’s 1-10, up in Breffni Park before the Kingdom finished the regulation series of matches on a high, crushing old foes Tyrone by 1-21 to 2-11 in Fitzgerald Stadium in early April. That seven-point margin of victory, combined with our win the same day over Donegal and Dublin’s defeat of Monaghan, saw Kerry qualify for the final against the still-unbeaten Dubs. That seemed a bit of a dubious prize for the Kerry lads, after what had been no more than a so-so run of League games for them. Dublin were huge favourites to land their fifth League title in succession when they met in the decider at Croke Park the following weekend but a fine display by the Kingdom, allied to a late free miss by Dean Rock (no chance he’d do that against us), saw the League title go south and, along with it, Dublin’s long unbeaten run as well. It was Kerry’s 20th NFL title and their first since 2009. You’d have thought that this spring bauble would have set Kerry up nicely for the summer and, with it, a right crack at knocking Dublin off their perch. It didn’t turn out like that, of course, and ultimately we were the ones to blame for this. Early on in the summer it was all going to plan for them. Clare gave them a decent match in the Munster semi-final at Ennis in June, Kerry eventually emerging from Cusack Park with a 1-18 to 1-12 win. Cork, however, prostrated themselves before the Green and Gold in the provincial decider, which Kerry won by 1-23 to 0-15 in Killarney in early July. By a strange coincidence, we found ourselves advancing on Croke Park in Kerry’s slipstream, having to meet and beat Clare and Cork once Kerry’s victories over them had tipped both Munster counties into the qualifiers. Then, in the All-Ireland quarter-final they met our Connacht conquerers, Galway, and were never troubled as they ambled to a painfully comfortable 1-18 to 0-13 win over the mediocre Tribesmen. So Kerry found themselves in the All-Ireland semi-final without having had to exert themselves unduly. We, of course, had had to endure – and enjoy – an elemental life-or-death series of matches before we too took our place in the last four. What fun those two August matches against the Kingdom were. Although we had their number in no uncertain terms in the replay – both on the field and in the tactical department – it’s worth recalling that we came within a whisker of losing to them the first day. Last Sunday’s late, late point from Paddy Durcan brought back memories of a far more important score he notched for us deep into stoppage time that day at Croke Park, his equaliser then ensuring we came away with a draw (on a scoreline of 2-14 apiece) and giving us a second opportunity finally to end a very long losing run to Kerry in the championship. Kerry had no choice but to go away and lick their wounds after that one. In the months since then they have, no doubt, been planning all manner of gruesome ways to avenge that defeat. We can, I’m sure, expect them to put their best foot forward against us at MacHale Park on Saturday night. They began their road to redemption last Sunday back on home soil. A 2-18 to 3-14 shootout against Donegal isn’t something you’d expect to see in late January but that’s what happened in Killarney on Sunday. Kerry were fortunate enough to emerge with a one-point win in that one – not least because Daithi Casey clearly hopped the ball twice just before shooting the winning point – but the victory will give them a bit of a bounce (if you’ll pardon the pun) as they head for Castlebar. The bookies still reckon – not, however, in any decisive way – that we’ll do the business on Saturday night: Paddy Power have us priced at 4/6 to prevail. Let’s not, though, leave the final say to the money men – how do you reckon this one will go? How will we do against Kerry? WJ. The maths don’t add up. 1-21 2-11 and ten point margin of victory. Just letting you know if you want to amend. Great article and the perfect appetizer for the weekend. Great read. I’m thinking the Kerry lads are coming with all guns blazing. We’ll have a tough game on our hands. Just going back again to all the posts that were put up about the Mchale park playing surface. With the Jan weather, which is usually poor enough, is their any reason that the GAA couldn’t move the whole block of fixtures so that the FBD and the other provincial leagues started say 4 to 6 weeks later with a later National League and Championship. I think it isn’t fair asking players to risk life and limb going out there in Jan and its ploughing up alot of pitches every year. I see in Dublin they have purchased a 50 acre field which is going to be used for re-sodding Croke Park every couple of years. At least the Dubs will always have a carpet to play on when they are at home. Thanks, Revellino – mental maths was never my thing! Corrected now. Goodman WJ I have plenty of trouble with the figures myself. A garda asked me one day for my date of birth. I told him April 19th. Hah Revillino. I had the dog in the back seat one evening and we pulled up to a checkpoint in Ballyvary. I was relieved to have everything in order and then the dog let out a loud bark over my shoulder at the guard. A bit startled he inquired, “Have you a licence for that fella”. “I do, but I never let him drive”, said I with a smug grin. My cockiness was rewarded with a slow, silent shake of his head and then a nod in the direction of my travels. The guards have a lot to put up with!! Great article WJ,i was all revved up just watching Andy scoring that goal, i knocked over the bin under my desk!what a brilliant day . nice to have a home game after the trek to Monaghan, that was a hard battle with resilience in bucketfuls from our lads. that ref for saturday doesn’t do much for me except make me grit my teeth,but i’m hopeful like someone said on an earlier thread that perhaps he has invested in a pair of glasses . The young Garda stared for a minute at him and went to get the higher up. Uncle is 6’04 and is a big fella so it worked. 5’06 mightn’t be as easy, you could end up in cuffs. Great piece Willie Joe, even if I didn’t quiet enjoy Andys goal as much as all the good people on here. I can’t even attempt a guess as to who is going to get a jersey on Saturday night but the whispers suggest that Jack Barry will be available which will improve our chances around the middle. Mayo had somewhere in the region of eleven or twelve players with championship experience under their belts out last Sunday where Kerry had only five in BJ keane, P Geaney, S O brien, Paul Murphy and Shane Enright, we had six players who never kicked a ball in senior Kerry jersey and it will be the same on Saturday night as EF simply doesn’t have the choice. Personally I would have preferred to meet ye in mid March when we have a few of our regulars back in the fold and when both teams would have increased fitness levels. Despite this I am looking forward to Saturday night to see how our young lads get on against hardened and experienced Mayo outfit. I don’t expect a victory but to be fair to them they played out of their skins last Sunday and showed experience far beyond their years but if they manage to leave McHale Pk with two points Harry Houdini himself would applaud with gusto. Is Boyler available this weekend?? We could do with him taking this weekend off to say the least !! Great time to play Kerry would be a very different story if this was a round 6 or 7 game, they were lucky to beat a Donegal side in transition at home and conceded 3-14 alarm bells ringing there. Inexperienced Kerry up against a experienced Mayo team. Home form hasn’t been great but i think this is one home league game that Mayo will win by a bit to spare. Game changer 10 u sound like decent bloke who knows his football. Thanks for your honesty. I’m not sure about boyler but I’d imagine he won’t be ready. He took a fair old knock and those dead legs take recovery. But we shall see. Though ye have depleted squad ye still have good forward line. Sean o shea. Stephen o brien. Geaney. Bjk. Clifford. Casey. All guys that can hold there own and score. So I won’t say we have the points in the bag until they really are in the bag lol home advantage and stronger experience squad should see us through but it’s all on the day. It should make for a good game weather permitting. Both teams on the back of hard fought wins so they will be eager for 2 more points. Where are james carr, matthew ruane, brian reape and Steven Duffy? I thought they were the young guns coming through? Are they likely to play at all in the league? James Carr is injured. The others I’d imagine it’s just a question of form. I would guess management is factoring in Sigerson. Recovery important and sports scientists have been highlighting recovery stats for young players much poorer than ye would think. Things like how high a fella can jump or sprint off the blocks significantly impacted. Having said that I think P Durcan plays Sigerson but he’s a hardened senior now with loads of S&C under the belt. Any white smoke from MacHale Park tonight? Is there a vote taking place on the club row in Hollymount ? Thank you lads for the insights. What about Freeman? Surely this is the time of year to try him out and give him one last opportunity to nail down a place. If not good enough, let him go. When are they trimming the panel? Must be around 60 on it currently when you include the injured lads. Thanks Mick! It wasn’t a significant one so, a bit like birthdays in real life (in particular for those of us of more advanced years), not worth pausing over unduly. Agree with Martin Ashford that would be good to see Freeman get a few run outs in League. Don’t see much point playing Cillian unless as sub. Also Andy played last game, do we need to keep relying on him. Kerry started loads of Rookies last week. That 2013 game was Aidan’s greatest day in Mayo shirt, his other best display also came from midfield against Aussies about 2 years ago in compromise rules. Some great memories there in that video. What a summer it was, all the same. Looking forward to tomorrow evening but will be approaching with caution. Last year we went and beat Kerry in their backyard and then came back and flunked what should have been wins at home. I can’t honestly say if complacency was a factor but we do like to live life on the edge in the league and and it wouldn’t surprise me to see the same pattern emerge this year. 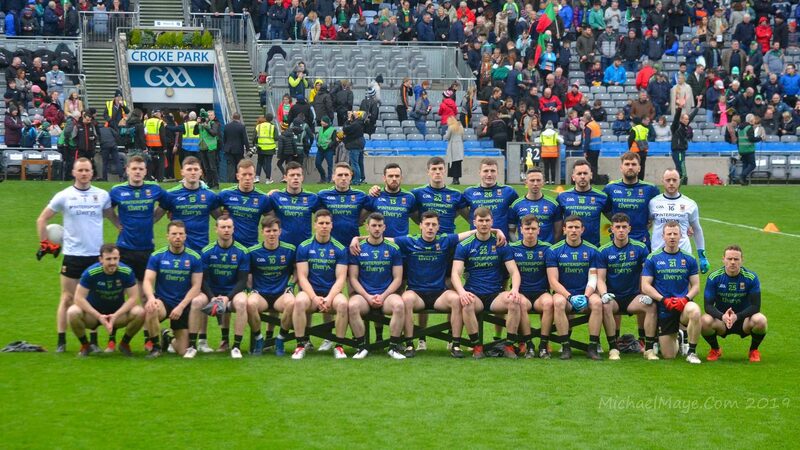 Kerry will be underdogs, anxious to make a statement tomorrow, and they have a bunch of young fellas that are well used to winning and will be chomping at the bit to put themselves into contention for summer. Make no mistake, we’ll have a battle on our hands. Which of course, is exactly what we want. On paper we should win, but if we don’t, let’s keep the heads and some perspective and move on … although if we manage not to win in Salthill on the 11th, I will happily lose the plot myself! Never know how much work Mayo have done early in the league as management give team a long break whenever we reach AI. Dublin claim to be only back 2 weeks but can bet they were in gym well before Christmas and maybe on individual fitness schedules. Take it with a pinch of salt. I suspect we’ve a bit more done this year than last because the Galway game is so early and Ros will be lining another ambush and Sligo might be no pushover either so I think we’ll be in very good shape come May if not sooner. Mayo only back a few weeks too but again would be shocked if they weren’t in the gym or on individualised programs pre Christmas. I’m pretty sure that players will have known themselves what they needed to do pre Christmas to arrive in the New Year in the condition they wished. For example Ger Cafferkey spent last year in the subs list and probably did a bit extra to ensure he met 2018 in good heart. Granted he was recovering from injury but I would say he felt that more was needed to make the recovery complete. Thankfully it looked fairly complete in Clones last Sunday. Similarly with Bernard Brogan of Dublin, sub in 2017, [and a pretty effective one] but he knows that with his age and pressure coming from up and coming young players he is getting too close to the exit door. So he does extra and starts 2018 in pretty good form. Is this game being televised? It’s live on Eir Sport, Dave. We seen Paddy Durcan show great big match temperament last weekend, as he has done in the past. Lets hope to see plenty more of that in the coming weeks from some of other players too, as thats what we’ll need to win All-Irelands. What we need to win an all Ireland is a panel of players with subs to come off the bench as game changers’. The league is an important stepping stone in developing that panel of players. Playing sigerson during the week is not a reason a layer can’t line out on bench and be capable of making an Impact. Kerry are using the league to build their panel for the championship. We should be doing likewise. The question is does Rochford trust these new kids on the block and I’m not talking about dubbing with two minutes remaining or worse still in injury time…. Kerry rarely travel anywhere with a point to prove. They are the heavyweights in the football world, after all. They have more All-Ireland titles than any other county and when they come to visit the red carpet is regularly rolled out. Their hosts might say that they mean business and they’re going to lay down a marker for the Kingdom, but truth be told they’re often star struck and caught in the headlights. 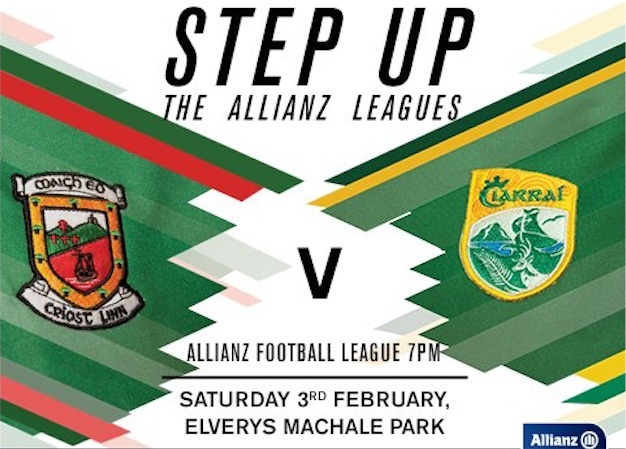 Mayo are one of the few counties who aren’t currently like that, along with Dublin and perhaps Tyrone and Donegal, and it will be to Castlebar on Saturday night that Kerry travel to and they most certainly will have a point to prove. The Green Above the Red hadn’t beaten the Kingdom in a game of serious consequence since the 1996 All-Ireland semi-final before last year’s blowout at the same stage, when the Kingdom ended with 13 men and a five-point beating. In public, manager Eamonn Fitzmaurice will point to his new-look team, all the first year players he has and the need to allow them time to find their feet at inter-county level. But behind the scenes he will also be impressing upon his foot soldiers the need to suppress this Mayo uprising with a strong showing at Elverys MacHale Park this weekend. Kerry have earned the right to pass off springtime defeats as burning off the dirty petrol accumulated through the winter, though this is a game they will want to win. From an Allianz League position perspective, there’s no great pressure on either Fitzmaurice or his opposite number in Mayo Stephen Rochford. Both recorded opening day victories, over Donegal and Monaghan respectively. Two defeats on the bounce would cause worries about a relegation fight and that’s not something either man will have to concern themselves with regardless of the result on Saturday. But this is a result that will matter to the Kingdom – last year’s embarrassing Championship exit won’t be forgotten that quickly. Kerry are likely to have the newer-look team as Fitzmaurice runs the rule over the young talent that is coming through from four consecutive All-Ireland minor winning sides, including the prodigiously talented David Clifford. Mayo haven’t got the same reservoir of talent at their disposal, though it’s no surprise that Rochford has rested some of his players that have been on the road so long – but not Andy Moran, it seems he’s bursting to play every game he can. Against Monaghan in Clones the likes of Neil Douglas, Shane Nally and Eoin O’Donoghue had their chance to stake their place. 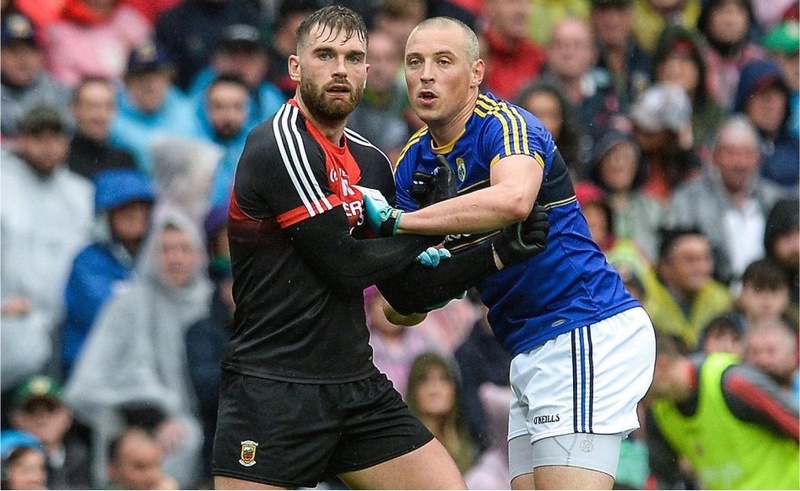 Last year Mayo and Kerry played out two hugely entertaining All-Ireland semi-finals. The first ended in a draw, with All Star forward Aidan O’Shea playing as an orthodox full-back on Kingdom dangerman Kieran Donaghy. In the replay, O’Shea spent long spells at full-back as well, but he moved the former Footballer of the Year around the pitch too and eventually Donaghy got himself sent off. Goals from Diarmuid O’Connor and Andy Moran sealed Mayo’s win, with only Paul Geaney’s ten-point haul and James O’Donoghue’s 0-03 off the bench keeping Kerry afloat in a 2-16 to 0-17 defeat. Looking at that team from 5-12 we should be too strong and experienced for anything Kerry can name at this point. Surprised if Boyler plays,but we’ll wait and see. I’ll be rooting for the Philadelphia Eagles on Sunday night. I’d love to see them win the Super Bowl. Philadelphia have never won it in its 51 year history. However, like Mayo and all Irelands, they won it 3 times when it was the old competition, the Nfl championship. The Eagles last won the Nfl championship back in 1960. It was the last year playing for 3 of its stars before their retirement. They are underdogs Sunday, but have been for their last few games. New England are like Dublin and going for their 6th title in recent years. Like Dublin and their finals, they have won many of these Super Bowls by tight margins. They beat the Eagles by 3 when the Eagles were in their last Super Bowl in 2005. They are possibly the greatest team with the greatest coach and the greatest quarterback to have ever played the game. Dublin on the other hand are not the greatest team to have ever played. That was the Kerry team who got pipped for their 5 in a row by Offaly. I lived for 6 and a half years in Philly and know from been a mad Mayo fan and from living there how stone crazy the Philly fans are about their Eagles. They have their work cut out for them on Sunday night against the great Tom Brady and his Patriots. I would dearly love to see Philadelphia win Sunday night and then in Summer see Mayo lift Sam. The Mayo team and the Eagles team have alot in common. They sure don’t look at the favourites tag.They never back from a challenge. They never die. Kerry have no prob naming 26. Well done to them. Our panel top secret. Looks a decent full forward line for Kerry and will be a good test for our back line. Would not pay any attention to the 15 we have named, it’s become a cynical exercise but like other posters I doubt that Boyle will start. Perfect game to test Akram. dont expect Boyle to start Nally needs a good game but may have his work cut out for him tomorrow, hope I’m wrong. Like to see better use of subs and them given at least 15 to 20 minutes . Like to see more of Adam Gallagher, hopefully tomorrow. Still would like to see a another midfielder in the match day squad not sure if Jason Gibbons is it but time will tell. Was hoping Matthew Ruane could step up this year surprised he isn’t challenging more at 22 years old even at Sigerson level to be honest. Agree with above. Not sure I would start Akram as his strentg is his pace and his runs into good positions. Gibbons game has not developed, limited what we will get from him. Def a game for Adam Gallagher. Matthew is only 21. Probably just a year too early yet. He will feature more next year.